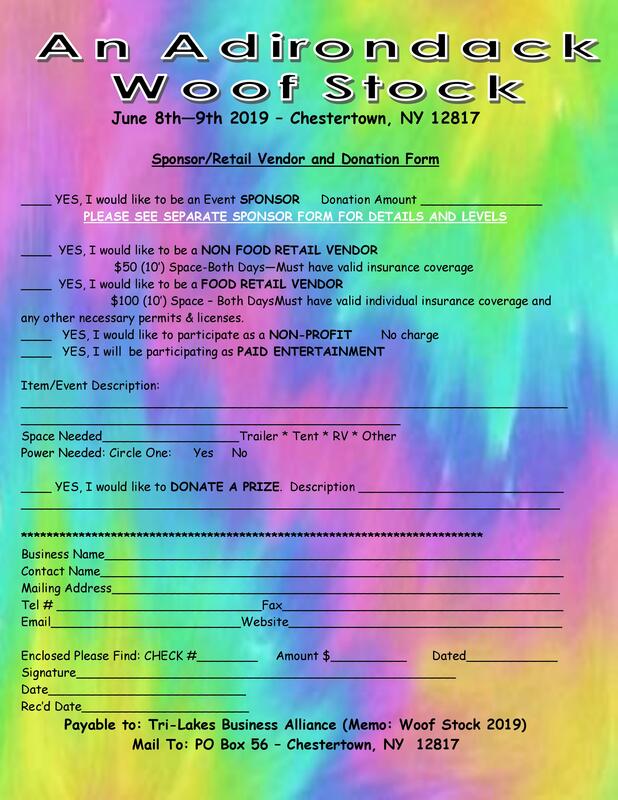 An Adirondack Woof Stock is June 8 & 9 2019 starting at 9 am on the field behind the Town of Chester Municipal Center at 6307 U.S. 9, Chestertown, NY 12817. 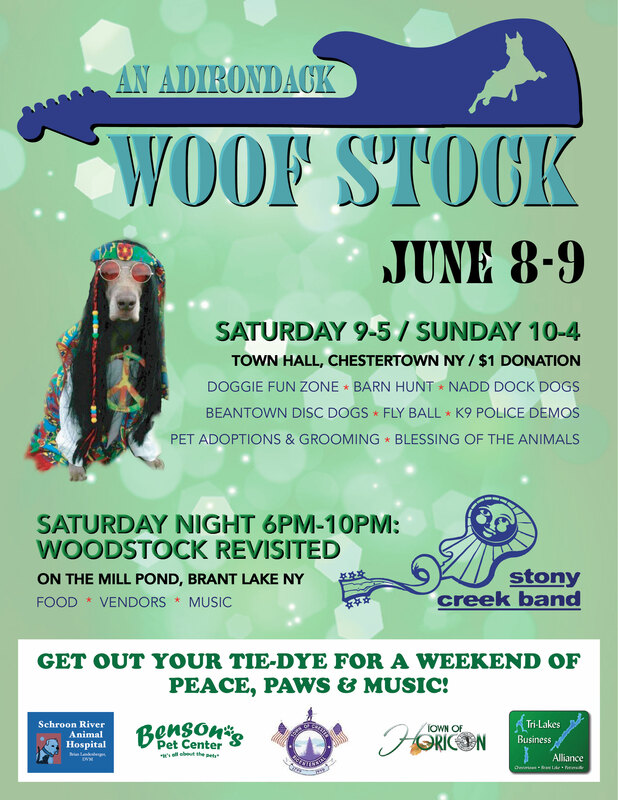 Get out your Tie-Dye and let’s travel back to 1969 at An Adirondack Woof Stock… “A Weekend of Peace, Paws & Music” in Chestertown NY on June 8th & 9th! It’ll be the best day of your dog’s life! 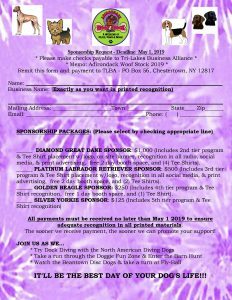 Let your canine companion try Dock Diving with the North American Diving Dogs or watch the professional competitions! Take a run through Doggie Fun Zone’s Agility and Lure Chasing Course, a huge hit with dogs of all ages and sizes! Live music, food and vendors—all day, both days! Watch K-9 Police Demonstrations, sit in on the Blessing of the Animals with Father John, adopt a pet from Adirondack Save-A-Stray and North Shore Animal League, let your little one tie-dye their own T-Shirt or shop with the vendors! Admission is $1—kids under 12 and dogs are free! 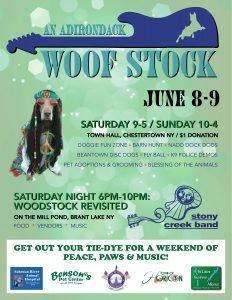 Saturday night, attend the “Wood Stock Revisited on the Mill Pond” a pet friendly outdoor concert in downtown Brant Lake with live music, vendors, food and a light show at The Hub….and don’t forget to wear your Tie-Dye! NADD Diving Dogs: Watch professional Dock Diving and let your dog take a jump too! Fly Ball: Good with a tennis ball? They’re going to love this one! Beantown Disc Dogs: Enjoy professional disc catching and let your dog give it a try as well! Doggie Fun Zone: Interactive Agility & Lure Chasing for your dog! Continuous Music: Both days by various musical groups! Blessing of the Animals: Held a few times each day. 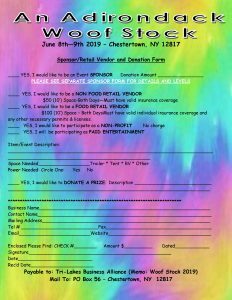 Vendors: Food, Tie-dyed items (for dogs & people), Dog groomers, Nail clippers, Veterinary clinics, Homemade dog goodies, Prescription raffles, Dog collars & More! Wood Stock Revisited at the Mill Pond: free boat rides by Loon Lake Marine, live music, light show, vendors and food Saturday night in Brant Lake!